The next School Counselor Tweet Chat is Tuesday, May 1, 2012 at 8pmEST! The topic of School Counselor Tweet Chat this month is Basics of Legislative Advocacy. Dr. Erin Mason (@ecmmason) will be our moderator for the #scchat! Join us as we learn ways to advocate for our profession on a legislative level. If you can't make it Tuesday, we are having a BONUS SCHOOL COUNSELOR TWEET CHAT on Saturday, May 5th at 1:00pmEST! We are doing a live chat with the Rhode Island School Counselor Association about Setting Realistic and Measurable Goals. My students and I have been loving the partnership I formed with our county career and technology center! In the past four weeks we have benefitted from a tour of the career and technical school for 5th grade students and guest speakers for Career Café sessions! Students from the culinary arts program, cosmetology program, and veterinary assistant program have visited our school for Career Café sessions with my 5th though 8th grade students. Not only are my students learning about careers that match their interests, but they are learning about the career and technical school and the programs they have to offer! I am hoping that this early exposure will ignite students' interest and help them see the connection between elementary/middle school and their high school opportunities. The veterinary assistant student did a great job explaining all the things she gets to do as part of her program. She explained that Wally helps her and other students practice the skills they are learning. She also spoke about options students have for post-secondary education after attending the career and technical school. She talked about how students could work as a veterinary assistant right after high school, attend college or a trade school to become a veterinary technician, or go to veterinary school to become a veterinarian. She shared with the students she plans to go to college to pursue a career as a zoologist so she can work with wild animals. Students had tons of great questions and were very engaged in the session. Many students stayed afterwards to pet Wally before they went back to their class. Which careers have you hosted for Career Café this year? Have you ever had a career session about careers with animals? New Free Spirit Publishing Blog Post: It's Ok to Hold All the Frogs! I have a new post on Free Spirit Publishing's Blog today! Check out my post about self-care for helping professionals: It's Ok to Hold All the Frogs! This past Tuesday I took my 5th grade students to our local career and technical school for a tour. I have created a great partnership with two of the school counselors at the career and technical school. They have been amazing and instrumental in helping me set up a tour for 5th grade and providing speakers for Career Cafe sessions (more about that soon)! My students and I have been looking forward to this trip to the career and technical school for months! In preparation for our trip I was trying to think of ways I could get some bonus career time with my students on the bus. I thought it would be fun for them to try to look for careers out their windows on the bus. I came up with a a simple Career Scavenger Hunt for students to complete on the way to and from the career an technical school. The kids LOVED it! The teachers loved it too because the students had EXCELLENT bus behavior! It was so rewarding to see them so engaged and excited about looking for careers out their bus windows! The whole time we were on the bus we were having a dialogue about all the different careers around us. I was even surprised by the number of careers there were. I told students that I would give the student with the most careers listed from each classroom a prize. I still need to count all of them because they listed soooo many! Career Scavenger Hunt How To: You can download a printable PDF version of the Career Scavenger Hunt by clicking here or by clicking on the pictures! The Career Scavenger Hunt directions say: "Look out the window. What careers do you see? Find and record as many as you can from A to Z!" How would you use the Career Scavenger Hunt with your students? Have you ever facilitated activities on a bus? I recently started blogging for Free Spirit Publishing's Blog! I love Free Spirit's books and I am so excited to contribute to Free Spirit's Blog, "a springboard of ideas for teachers, counselors, and anyone who cares about kids!" 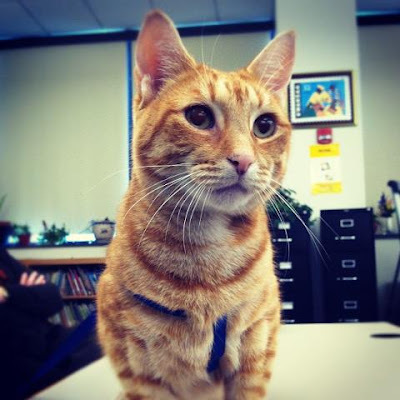 Check out my post that went live today: A Bully Called Buttercup! 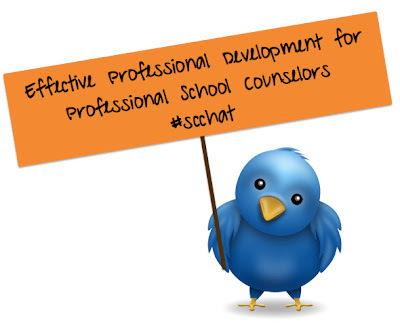 April's #SCCHAT was held on April 3, 2012 at 8pmEST. We chatted about Effective Professional Development for Professional School Counselors. There was so much energy around this month's #scchat topic! We chatted over an hour! School Counselors shared information about professional development topics they find import and how to advocate for relevant professional development! The next School Counselor Tweet Chat is on Tuesday, May 1, 2012 at 8pmEST. Dr. Erin Mason (@ecmmason) will be moderating the chat about Basics of Legislative Advocacy! 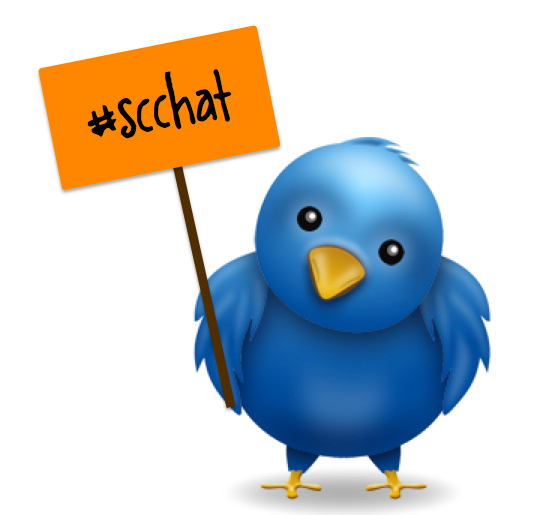 We will also be hosting a BONUS #SCCHAT on Saturday, May 5, 2012 at 11:30amEST. We will be hosting this live chat during the Rhode Island School Counselor Association State Conference!